We spent over 50 hours researching and testing over 20 different styles and brands of kitchen tongs and found that durability, sturdiness, and cost were the most important factors consumers looked at when shopping for kitchen tongs. StarPack Premium Silicone Kitchen Tongs scored high marks in all categories when compared to the competition and is our overall top pick. These sturdy kitchen tongs feature silicone tips, an excellent grip, and are melt, flake, and rust resistant. The strong, thick stainless steel used in the construction of these tongs has a ring pull lock on the end. These well-made tongs will last a long time. Restaurant professionals think of kitchen tongs as additional hands and for good reason. They are great for grabbing hot food and pans and prevent burned fingertips. They are used for grabbing things out of boiling water or oil, grabbing onto grill grates, and a host of other tasks that you can’t use your own hands for without sustaining an injury. They are also routinely used for serving, stirring, and getting a hold of hard to reach places as well. With all of these important uses, it’s no wonder that kitchen tongs are such an important kitchen utensil. You want the kitchen tongs you purchase to be strong and should be able to lift, jostle, flip, move food, including delicate food like tender fish easily. With the right pair of tongs, many kitchen jobs become easy. With all of the different styles and brands of kitchen tongs on the market it can be a challenge to figure out which ones are the best for your kitchen. Below, we have reviewed three of the top-rated kitchen tongs on the market so you can study them and see if any of them fit what you are looking for. We have also included an informative buying guide that will help you by providing information about kitchen tongs so you know how to tell the flimsy ones from the strong, sturdy ones that can handle the kitchen tasks you need to do. StarPack Premium kitchen tongs offer the best control and grip you can find in a pair of tongs. They are made from thick, 1.00 mm stainless steel and won’t flake into the food you’re cooking or serving, won’t melt and won’t rust. They have a convenient, ring pull locking mechanism that is designed to stand up to heavy use. You can use these StarPack tongs for a number of jobs in your kitchen. The food-grade silicone used on the tops of these tongs are heat resistant up to as high as 480 degrees and have been tested for safety. They contain no parts that are removable so bacteria can’t grow in the crevices and spaces like it can with other utensils. These strong kitchen tongs are 100% BPA-free and are non-stick as well so they don’t scratch your cookware. Your StarPack kitchen tongs can be washed in the dishwasher for easy cleaning. 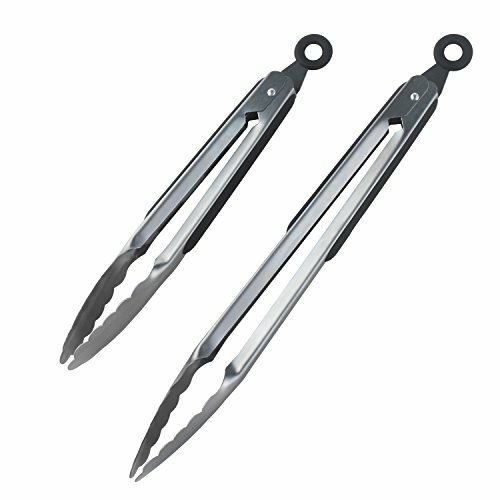 There are two pairs of tongs in this set; 1 – 9” pair and 1 – 12” pair. StarPack stands behind their kitchen tongs by offering a full refund or replacement if you are unhappy with your kitchen tongs in any way. DRAGONN kitchen tongs have great features that make them one of the most popular pair of tongs you can purchase. This set comes with a 9” pair and a 12” pair. The non-slip rubber handles provide excellent grip so you have the safety you need along with comfort during use. The conveniently located locking mechanism allows for simple storage right into your kitchen utensil drawer so they are not getting caught on things while they are in the drawer. Cleaning your DRAGONN kitchen tongs is super easy; just put in your dishwasher and you won’t have to worry about scrubbing them by hand. The lightly raised edges of these tongs provide users with exceptional grip so you don’t drop what you are flipping, serving, and grabbing. DRAGONN offers consumers a terrific 3 tier guarantee. If the tongs are damaged or they break they will replace it for free. All you have to do is ship it back. If you’re unhappy with the tongs for ANY reason they will refund your money. All you need to do is ship them back. OXO Good Grips is a company that is known for great, quality kitchen tools and these kitchen tongs are no exception. 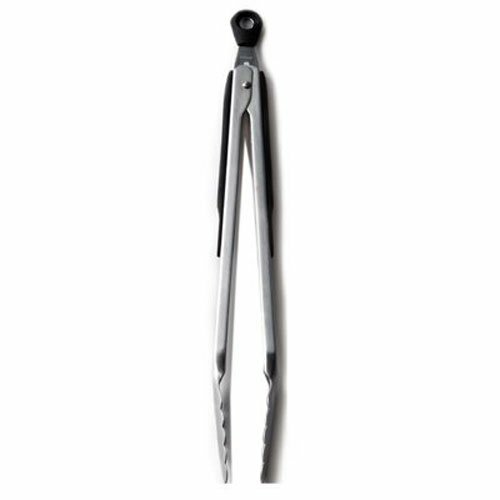 The brushed stainless steel tongs are strong, durable, and long lasting. They measure 12” and feature a convenient, large pull-tab lock that makes them easy to store. OXO kitchen tongs are dishwasher safe for easy cleaning and the comfortable handles are slip-proof regardless if they are dry or wet. These kitchen tongs are so strong you can life a whole cooked chicken with them without worry of the tongs breaking or bending. 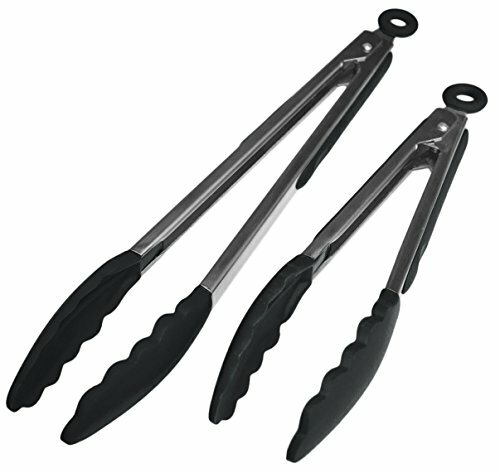 The scalloped edges of the OXO Good Grips kitchen tongs feature a 13 degree angle so they can grip onto food tightly. The durable spring ensures the kitchen tongs strength and the stay cool handles and pinch-free design with large rubber grips prevents any other problems during use. Storage is easy, just lift the lock at the top up to close and then you can place them in your utensil drawer or hang them up for easy, out of the way storage. These award winning kitchen tongs are affordable and will last a long time with proper use. The three top-rated kitchen tongs that we have reviewed above are all excellent examples of the kind of sturdiness, strength, and quality you want to find in a pair of tongs. All three are made from quality materials that are designed to withstand heavy use without fear of them bending or breaking. Taking the time to find quality tongs for your kitchen allows you to take care of the tasks you have easily so you can enjoy the cooking process without struggling to serve, flip, or stir the food you are cooking. The right pair of kitchen tongs will feel like you’ve gained an extra pair of hands. When you are ready to purchase a pair of kitchen tongs for your kitchen, choosing one of these top-rated kitchen tongs that we have featured here is a great place to start. If none of the top-rated selections are quite what you are looking for, we have added 7 more quality tongs for you to consider. There are some kitchen tools that are must have for every kitchen, residential or commercial and kitchen tongs are at the top of that list. They are routinely used to remove food from boiling water or hot frying pans, remove pieces of toast from the toaster oven, flip food on a grill and so much more. They can even be used to reach something that is on a shelf that is out of reach. Whatever jobs you do with your kitchen tongs we’re sure that this valuable kitchen utensil is one of the most often used item in your kitchen. There are dozens of different brands and styles of kitchen tongs on the market. To ensure that you get tongs that are durable, long lasting, and strong you need to know what to look for. We have provided some tips for choosing the right tongs below. Tongs that have silicone on the tips are safe for virtually any kind of cookware and will not scratch or scrape them. They are also good for gripping food that is slippery but will not offer as tight of a grip as stainless steel tips will. Kitchen tongs with nylon tips are also cookware friendly but keep in mind that they do not have the same heat resistance as silicone and stainless steel and can melt if it is left against a hot pot. Tongs that have rubber or silicone grips on the handles are much more comfortable and protect the hands from getting burned if the tongs get hot. It also makes the grip much more secure if your hands are greasy or wet. The easiest tongs to use are spring-loaded rather than X-shaped, scissor-like, or the bent tongs that are more flexible in design. They are also much more comfortable to handle and use. Locking tabs are great for holding the tongs together when you are storing them. Sometimes the locking tab will have a hole that is used to hang the tongs from a hook rather than keeping them in a drawer. Depending on the style and brand, some kitchen tongs will have a locking tab that is activated by turning the tongs upside down. Tongs come in many different sizes that range from 6” up to 18” or more. Some of the barbecue tongs can be as long as 20” or longer. Shorter tongs provide more control over what you are doing but longer tongs are ideal for tasks that involve high heat because your hands will be farther away from the heat. Never try to use short tongs to remove food from a grill or boiling water or oil. You can easily get burned because there is not enough space between your hands and the heat. Most kitchens have more than one pair of tongs for this reason; a shorter pair and then one or two longer pairs as well. There are several different types of kitchen tongs on the market for you to choose from. We have listed the different kinds below along with information on their differences. Stainless Steel Locking Tongs – Stainless steel tongs are used every day in commercial kitchens for stirring foods such as pasta as well as to get a hold of hot pans and cooking sheets and to lift food in and out of hot pans and pots. They can be used the same way at home. Locking tongs feature a lock at the end of the tongs on the handle side that holds them closed. The gripping end of the tongs is typically scalloped-shaped or shaped like a spatula for flipping and grabbing food. Stainless locking kitchen tongs are very sturdy and are affordable as well. The drawback to stainless tongs is the scratching they can cause to your non-stick and regular cookware. If you buy a lesser quality brand of tongs you may also find the locking mechanism can be finicky. Covered Locking Tongs – Kitchen tongs that have silicone ends are even better than regular stainless kitchen tongs because they will not scratch your cookware or non-stick items at all. The silicone covers the gripping ends of the tongs and provides an excellent grip, especially if the scalloped ends are significant. Don’t look for tongs that have jagged ends or you can tear or shred the food as you remove it from the pans. If they are too smooth, grip might be affected so it is important to try and find the right tongs with just the right amount of scalloping. Covered tongs are not ideal for trying to grip or turn delicate food such as tender fish and other similar foods. They also take up more space than non-covered varieties. Pasta Tongs – Pasta tongs are usually made from one piece of metal and are great for removing large amounts of noodles from a boiling pit of water or for serving pasta without ruining its texture and shape. Pasta tongs that have tines on the end make it even easier to pick up pasta and stringy food without having them slide right off the end. Do not use this style of tongs on the grill due to the short handles. Scissor Tongs – Scissor tongs may seem like a handy idea but in reality they are not good at holding anything. Basically, the scissor tongs are really only good for removing hot dogs from the pot and not much else. They are very hard to work and control and are not strong enough to hold anything with any weight to it. Some people may like them but in general they are not recommended as a good option for kitchen tongs. Ice Tongs – Ice tongs have little teeth that make them great for grabbing individual ice cubes. If you do a lot of entertaining and have a home bar, you will definitely want to have a good pair of ice tongs. Trying to grab ice with a regular pair of kitchen tongs can be a real challenge. These tongs are generally JUST for ice since they can tear and rip regular food and are just not big enough to be of use for cooking. Barbecue – Barbecue tongs are very long, measuring 18” or more and are perfect for removing food from tall stock pots and grills. You won’t have to worry about burned fingertips or sleeves that catch on fire because the tongs keep your hands and sleeves away from the danger zones. Because they are so long, it is not easy to store barbecue tongs so many people will hang them or even keep them out with the grill if there is a storage shelf or drawer underneath it. The longer, standard locking tongs can be used to grill but keep in mind that your hands will be a lot closer to the grill and use caution. Plating Tongs – If you are not a professional chef or cook, you may not know what plating tongs are. They are basically oversized tweezers that are used for moving tiny things on the plate in fancy restaurants. They are all about presentation which is why they are mostly used in fine dining restaurants and not your average kitchen. These tongs offer perfect grip for tiny jobs and are not really practical or needed in home kitchens unless you are that particular about food presentation. Kitchen tongs are one of the most often used utensils in home and commercial kitchens. They are perfect for a variety of jobs that enable you to avoid burned fingertips and other accidents. Every home typically has at least one pair of kitchen tongs but having several in different sizes and styles is never a bad thing. The three top-rated kitchen tongs we have reviewed above make excellent choices if you are looking to add a pair of quality tongs to your kitchen utensil collection. With all of the different sizes, styles, and brands available, these three provide you with a good selection that will take care of many cooking tasks. If you are not done looking around, use the information in this buying guide to sort through the many choices and separate the quality tongs that come from reputable companies and are made from premium materials that will stand up to regular use and last a long time and the ones that will break unexpectedly when trying to serve paste or lift chicken out of the frying pan. This knowledge will help you spot the flimsy kitchen tongs right away and avoid wasting your money on them. To find out some inside information on any kitchen tongs you are considering check out the customer comments and reviews. Customers are more than willing to describe their experiences with a certain product they have purchased and used and it gives you the chance to see how they are really holding up in day to day use. Top 10 Golf Bags Golf Bag Buying Guide What is a Golf Bag? Your golf bag is your best friend on the golf course….